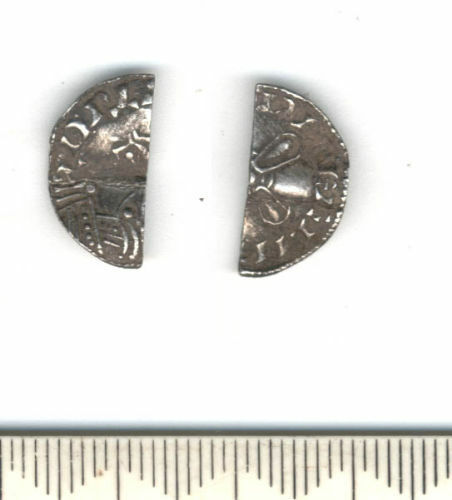 Obverse description: Bust facing left, pellet with three straight bands falling left, then oblique pelleted zone (robe hem) falling towards right,riging hem from behind this towards right, pellet and three incurving bands falling at right. Small face with two 'tufts' of hair. Reverse description: Cross composed of four ovals united at their bases by two circles enclosing a pellet (half, cut diagonally between arms). Reverse inscription: Present but unclear. Medieval coin: penny of Harold I.